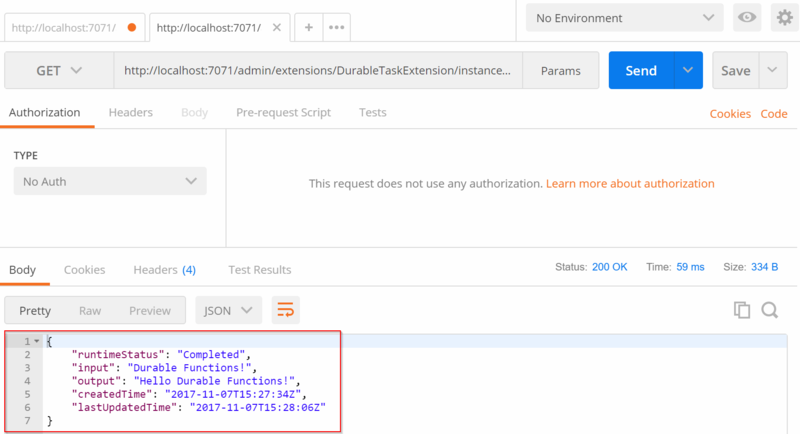 In my previous post I gave an introduction on Durable Functions, an extension on Azure Functions which can be used to write stateful and long-running orchestration functions. 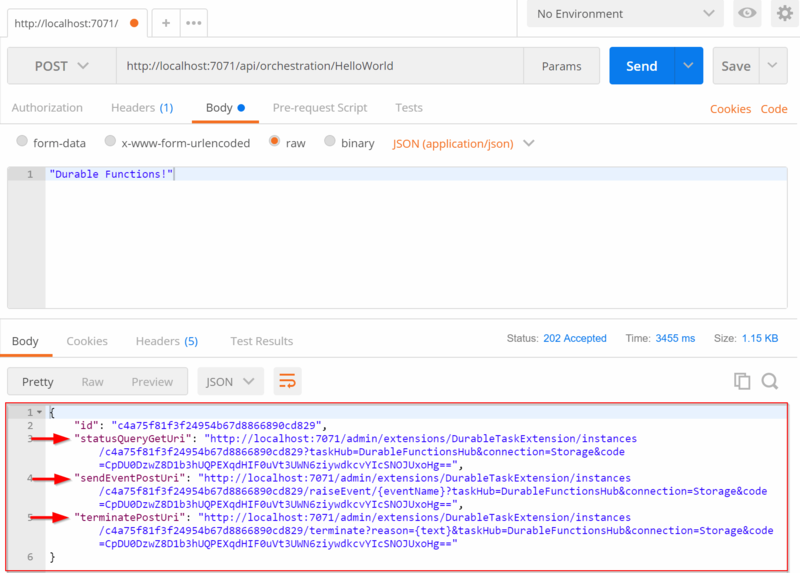 In this post we’ll look into more detail at the HttpStart and HelloWorld functions from the previous post. We’ll run them locally by triggering them using Postman and looking at the responses. HttpStart, the HttpTrigger function which starts an orchestration function. HelloWorld, the most basic orchestration function ever. CollectNames, an ‘eternal’ orchestration function which waits for external events (I’ll cover this one in the next blog post). Have a look at the Developing Durable Function section from my previous post in order to make sure you have all the required components to run the functions locally. In the Body tab, select raw and JSON (application/json) as the content-type. Type a string in the body of the request, such as “Durable Functions!”. Click Send to do the request. This is because you receive the response from the HttpStart function (the DurableOrchestrationClient) and not the HelloWorld function directly. statusQueryGetUri; when a GET request is made to this endpoint the status of the orchestration function is returned (a serialized Durable​Orchestration​Status). sendEventPostUri; when a POST request is made to this endpoint (including a valid event name and event data) an event is triggered which can be picked up by an orchestration function. I’ll come back to this in the next blog post. terminatePostUri; when a POST request is made to this endpoint the orchestration function is stopped without waiting for normal completion. The id in the response is the InstanceId of the orchestration function. Now you have the input & output of the HelloWorld orchestration function and the status of the function. Sending requests to the sendEventPostUri and terminatePostUri endpoints don’t make sense in this orchestration function since it’s not listening to external events and it is completed quite fast so terminating it before it reaches completed state is difficult. I’ll get into these two methods in later posts. Finally, if you want to see where the local orchestration function history is kept, (which is used by the Event Sourcing pattern) you can have a look using the Microsoft Azure Storage Explorer tool. This is a great tool when you’re working with any type of Azure Storage, including local emulations. At this moment you should have gained some insights how to run & debug Durable Functions locally. In the next post I’ll demonstrate an ‘eternal’ orchestration function which waits for external events and is stateful.